1.A deposit of 50% of final balance due per group is required to confirm accommodation. 1. Children under 18 to be supervised by adults. a. No noise or disturbances to other guests after 11pm. b. No damage or breakages to Hostel property. Ballinskelligs (Baile an Sceilg) is a seaside resort on the edge of Ballinskelligs Bay. Ballinskelligs is a renowned Gaeltacht (Irish speaking area). The area has miles of sandy beaches and fantastic scenery. Overlooking Ballinskelligs Bay, The Skellig Lodge is located in the heart of Ballinskelligs. It is only 5 minutes walk to Ballinskelligs Beach, one of Ireland best Blue Flag Beaches, and just off The Skellig Ring 'A Secret Ring off the Ring of Kerry' between Waterville, home of the famous Waterville Golf Links and the spectacular scenery of Valentia Island. The Skellig Lodge, built in 2003 is registered with Failte Ireland and meets the highest standards of comfort and convenience for guests. 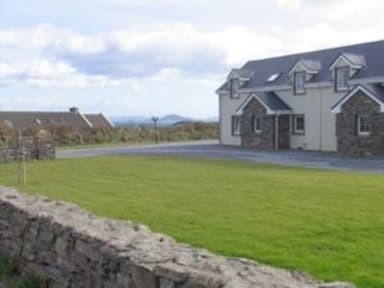 With warm, spacious, fresh and bright bedrooms with stunning views over the Ballinskelligs Bay and mountains with great modern facilities, fully equipped self- catering kitchen, Dining Room, Lounge, TV and free wireless surfing. The Skellig Lodge is the ideal place to stay when exploring this most beautiful, hidden part of Ireland's rugged south west coast. Local tourist attractions include boat trips to the Skellig Rock also known as Skellig Michael, the UNESCO World Heritage Site, the iconic McCarthy, the Gaeltacht village of Dungegan or Dun Geagan in Irish, is home to a restored thatched cottage and a pre-famine village Cill Rialaig, now used as an International Artists and Writers Retreat or you might just want to indulge in and visit The Skellig Chocolate Factory amidst the awe-inspiring scenery of the Skellig Ring. 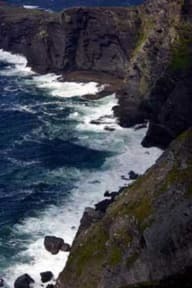 Ballinskelligs has a variety of outdoor activities such as hiking, swimming, diving, surfing, wind surfing, kayaking cycling, angling and golfing. TheBallinskelligs Reggatta is a very popular every summer for those interested in water. From The Skellig Lodge, a short walk on the beach will bring you to two pubs, restaurant, Beach Cafe, deli, take away and grill, and a country market ( every Sunday in June, July, August ) with entertainment by local singer's & musicians. Reception is ONLY open from 15.00 pm to 19.30 pm. We asked our guest to please ring the hostel DURING RECEPTION HOURS to schedule late arrival. Das Haus, die Zimmer und die Küche sind sehr sauber und ansprechend, die Gastgeberin extrem freundlich, sie hat sogar für uns extra einen Kuchen gebacken! Die Küche zum Selberkochen einladend und voll ausgestattet. Äußerst ruhige Lage mit Meerblick. Sehr nette Besitzerin, wir konnten alle unsere nassen Klamotten im Trockner trocknen. Ruhige Lage. In der Gemeinschaftsküche konnte man Cornflakes und ein bisschen Toast bekommen und ansonsten konnte man selbst Mitgebrachtes zubereiten. Leider ein sehr kleiner Ort, in dem die Küche des Pubs geschlossen war und wir daher ohne Selbstversorgung schwer an Essen kamen. Insgesamt trotzdem zu empfehlen.